The three-time Olympic medallist now has a new title (and is getting less sleep). Olympic medallist Andre De Grasse delivers remarks prior to a street exhibition of track and field at Nathan Phillips Square in Toronto on Tuesday, June 12, 2018. 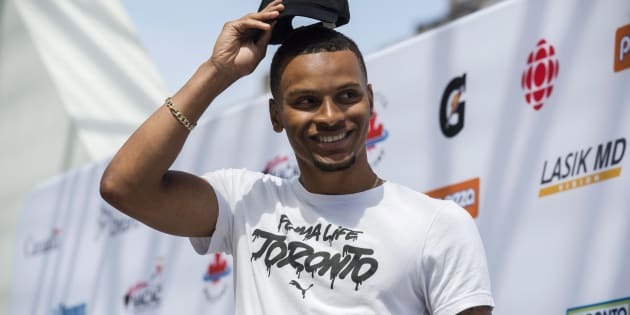 VANCOUVER — He's enjoyed the thrill of winning an Olympic medal and dealt with the frustration of battling through injury, but Andre De Grasse says becoming a father is a totally new experience. De Grasse's girlfriend Nia Ali gave birth to a girl Saturday in Philadelphia. The couple have named the child Yuri. Ali, a sprinter with the U.S. track and field team met De Grasse while they were both attending the University of Southern California, reported Canadian Running. Ali won a silver medal in the 100-metre hurdles at the 2016 Olympics. 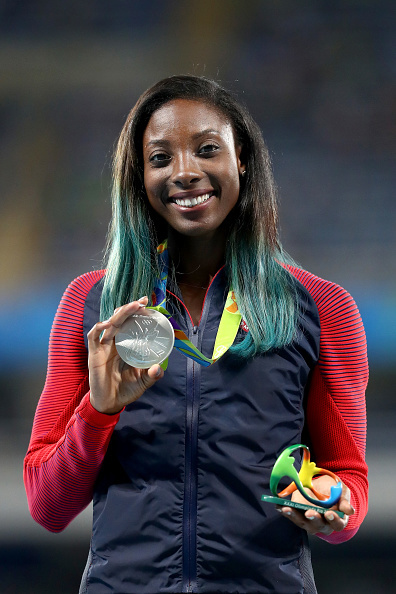 Nia Ali of the U.S. poses on the podium during the medal ceremony for the women's 100-metre hurdles at the Rio 2016 Olympic Games. "It's a different type of feeling," De Grasse said Monday. "It's a new step into becoming a man. It's a new chapter in my life. It's going to be a great ride. I'm looking forward to enjoying it." De Grasse is in Vancouver to compete at the Harry Jerome International Track Classic. He will run the 100 metres Tuesday night and on the 4x100 relay Wednesday. Both events are part of the Jerome meet's China-Canada Sprint Challenge. Escaping to the West Coast has allowed the triple-Olympic medallist to catch up on some rest. "It's been a little bit no sleep," De Grasse chuckled. "I get a chance to get away a little bit. I'm in the hotel and get a little sleep." Canadian sprinter Andre De Grasse, front left, of Toronto, stands with the rest of the 4x100-metre relay team during a news conference for the Harry Jerome International Track Classic, in Vancouver, on June 25, 2018. De Grasse is looking to get his season back on track after a couple of disappointing Diamond League performances. The 23-year-old from Markham, Ont., said he finally feels healthy after recovering from a Grade 2 hamstring strain which forced him out of last year's world track and field championships. De Grasse also decided to skip this year's Commonwealth Games. "I went back to the drawing board after a couple of races," he said. "I'm feeling better now, a little more fit. "I think I'm really good. The last couple of races my fitness really wasn't there. Now we have been clocking some good times at practice. Now I just have go out there and compete and make it happen." De Grasse plans to use the Jerome meet as a springboard for next week's Canadian championships in Ottawa, then return to Europe for a couple of Diamond League events. "I want to score some points there and try to get into the Diamond League final," he said. Andre De Grasse, left, takes the lead to the finish line beating Aaron Brown, right, to win gold in men's 200-metre race at the Canadian Track and Field Championships in Ottawa on July 9, 2017. One of the people De Grasse will race in the 100 is Aaron Brown, his teammate on the 4x100 relay squad that won bronze at the Rio Olympics. "It's good motivation for me," Brown said about racing De Grasse. "I want to be the best in Canada. To race the reigning champion, it's always good to have that competition. "I want to make sure I can execute. He keeps me honest, I keep him honest. We make sure we bring our A game. That's what it's all about. We want to have good performances here and push each other to do great things." Brown has enjoyed a strong season, going under 20 seconds for the first time the 200. He ran 19.98 for a second-place finish at the Bislett Games in Oslo last month, becoming the third Canadian in history to dip under the 20-second mark (De Grasse and Brendon Rodney are the other two). He credited his success on the support he's been given by his coach Dennis Mitchell, medical team and agent. "We put a great plan into place and we just have been following it," he said. "At the beginning of the season I talked with my coach about what I wanted to achieve, I talked to my medical team about how I can improve myself, so I'm not hurt and missing time and be at my peak. Canada's Andre De Grasse, left to right, Brendon Rodney, Aaron Brown and Akeem Haynes show off their 4x100-metre bronze medals at the 2016 Summer Olympics in Rio de Janeiro, Brazil on August 20, 2016. "It's all been kind of in sync." Brown's performance has been a surprise to some people but not the 26-year-old from Toronto. "This is what I expect, and I've been expecting it for a couple of years," he said. "It just hasn't turned out that way. That's the thing with track. "You are happy when it (clicks) and you finally break through. It's something I have been planning for. I want to build off that." The China-Canada Sprint Challenge features men's and women's teams of 10 athletes each competing in the 100 and 400 metres, plus the 4x100 and 4x400 relays. Points are awarded and the top team takes home $30,000. De Grasse said he enjoys competing at the Harry Jerome. "I have been here the past couple of years," he said. "It has always been really good to me, the fans and the chance to see all the kids. "It's been a great opportunity for me."